(Note: This entry on the list is relatively new, so know that there are minor spoilers). If one hasn’t seen most of the adaptations on this list – specifically those in the Marvel Cinematic Universe – they might not have seen much in Avengers: Age of Ultron beyond some big explosions and that time they picked up a city. On the surface, this film is more about spectacle than heart but it is counter-intuitive to assess this movie in a vacuum when it’s most defining attribute is that it is the culmination of years of colliding story-lines. Clearly, I have seen the many films and shows informing the Avengers sequel and as such cannot remove myself from the power of certain scenes that might otherwise have felt out of place. The two that come to mind in particular are the much-maligned Thor nightmare sequence and the Steve Rogers brief glimpse into a past that heartbreakingly never happened. Thor’s scene is exactly what episodic/universe content is all about. It may not have had anything to do with the rest of the flick, and it can be criticized as being a commercial for another movie inside of a movie, but these ever-connected and far reaching narratives are what we paid to see. This is what separates the MCU from adaptations of years past. Like when reading comics, you know that your investment in stories and characters can be developed almost infinitely. When Scarlet Witch enchants Captain America into a deep hallucination and he stands for a moment on a blurry dance floor with Agent Peggy Carter, she wasn’t just opening a wound for him but one for the audience that runs real-life years deep. If you watched Agent Carter, that scene had double the impact. This is also true of Black Widow’s entire story arc. One of my own biases I’m seeing emerge as we get deeper into this list is that I tend to personally prefer stories that are not origin tales. I’ve seen Bruce Wayne’s parents get shot and Spider-Man get bitten by that damn arachnid a few thousand times in my life. The irony here is that most comic book stories are not origins, and many heroes beginnings weren’t known in print until deep into their run. Many adaptations get bogged down in trying to justify the existence of costumed people and a need for heroic actions. Climbing that first hurdle of suspension of disbelief tends to take up a lot of time rehashing things that those of us who are already fans of the source material have probably seen done better before. 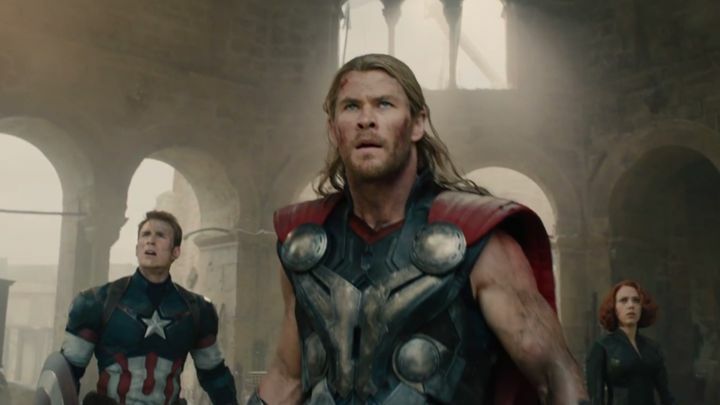 Avengers: Age of Ultron carries none of these burdens. It jumps right into the action with multiple heroes, villains, and high stakes. It gets to fill the screen with interesting, powerful, and evocative characters like never before, without having to take the audience’s hand and justify everything. This is the world we live in now, the Avengers just exist. They’ve been Avenging for years now. You’re either in or out at this point. And because it exists where all this amazing nonsense is just accepted, I got to type “Scarlet Witch enchants Captain America into a deep hallucination” about a movie that made a billion dollars. Now, I never have to grow up. There were a lot of “deep cuts” in this movie and it was heavily reliant on nostalgia (though all of this stuff is really), but it should not be forgotten how tight a box Avengers: Age of Ultron was in. It had to be informed by the first Avengers, three Iron Man movies, two Captain America movies, two Thor movies, The Incredible Hulk, Agent Carter, and nearly two full seasons of Agents of S.H.I.E.L.D. It also had to keep in mind more sequels to all of those franchises plus the Netflix series’ Daredevil, Jessica Jones, Luke Cage, and Iron Fist that will be coming after it. All that in mind, it’s not surprising they shied away from telling an especially complex story that changed and developed its main cast. Though, it did introduce three masterfully rendered characters in Elizbeth Olsen’s Scarlet Witch, Paul Bettany’s Vision, and James Spader’s phenomenal Ultron. It was an event film – informed by all those stories – and as such packed a pretty hefty emotional punch, even if the legwork for those payoffs was done in other places. I could have stood for a longer segment when the team was just hanging out at HQ, or a few more scenes like it, but Avengers: Age of Ultron accomplished something few other films in history have. It didn’t tell one story from beginning to end, it furthered 12 stories and entertained informed audiences with “oh my god” moments from its first frame to its last.